How many thousand people were at PoP2016 is unknown – but with every side of the speaker’s mound crowded, the previous record 4000 was certainly exceeded. The political significance of PoP is highlighted by the fact that it attracted 3 party leaders (Lab, LibDem and Green), the Transport Minister from the recent SNP government and many other politicians (see below). With the Holyrood election imminent, policies and promises were on everyone’s mind. Investment depends on the election results and on continuing pressure on politicians, by people like you – before the election and after the election! 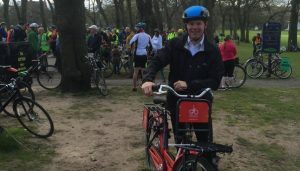 SNP: Transport Minister in the recent Parliament Derek Mackay, who arrived on an Abellio hire bike, promised that cycling investment would not fall from its present record level (i.e. just under 2% of the total transport budget). Labour: The manifesto is not yet published, but Spokes member Sarah Boyack said that more investment is needed and that Scottish Labour would ‘work towards’ 10% of the transport budget being invested in active travel, following the example of Edinburgh City Council. 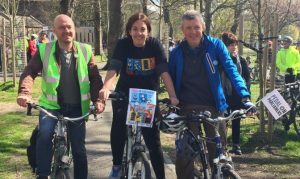 LibDem: Party leader Willie Rennie, who had cycled from Fife, promised an extra £20m a year cycling investment (which would increase funding from 2% to 3% of the transport budget). Green: Spokes member Alison Johnstone re-iterated the Green promise to invest 10% of the transport budget in active travel. Conservative: Speaker Miles Briggs didn’t give any cycling investment figures, though their manifesto does have something to say on this. i.e. 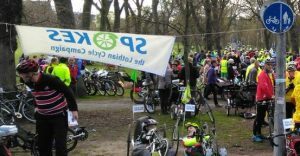 politicians who attended #PoP2016. We’re bound to have missed some – please let us know, and send us their twitter name.